This change aims to develop students as creators of digital technology, not just users. Importantly, it also encourages students to consider their roles and responsibilities as digital citizens. In 2017, Papakaio School in rural North Otago celebrated its 150th anniversary. On that day, two former students, Gloria Hurst from the Waitaki Community Gardens Trust, and Michael Trengrove from Digital Future Aotearoa, brought their areas of expertise together: nature-based wellbeing and digital tech education. Together they planted the seed of an idea that will change the lives of thousands of Aotearoa children: the Electric Garden. The Electric Garden is a hands-on, Internet of Things (IoT) solution to help schools deliver the new Digital Technology curriculum content. 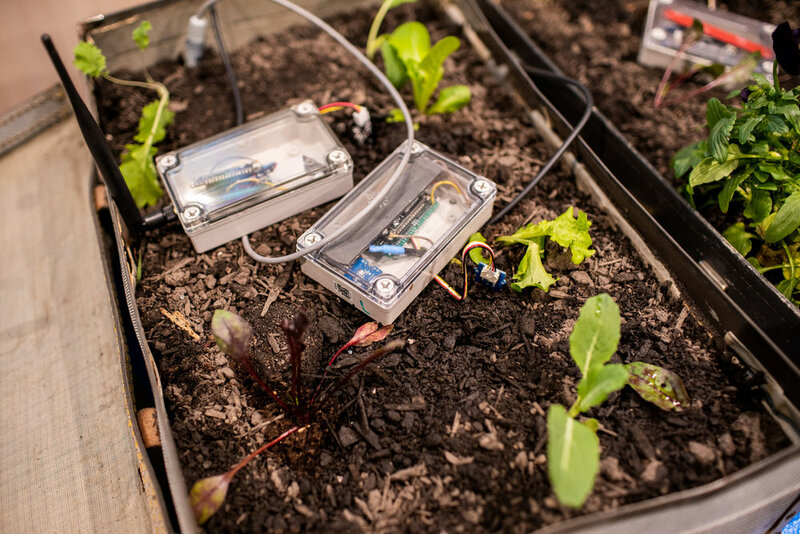 Using the Electric Garden, children install wireless sensors in their school garden, and gather and monitor data through an online portal. This results in more than giant pumpkins! The Electric Garden supports digital learning, develops gardening knowledge, and promotes wellbeing by the children spending time in nature. Since that first conversation at Papakaio School, the project has received close to quarter of a million dollars of funding from Microsoft Philanthropies, The Spark Foundation and Verizon Connect. The pilot project began in October 2018, with 200 teachers from 75 South Island schools receiving their own Electric Garden, training, learning resources and lesson plans, and ongoing technical support. Once the pilot is complete, the Electric Garden will be rolled out to the rest of Aotearoa so all children can learn and grow in a connected world. How can I get an Electric Garden? Our initial pilot programme was rolled out in Canterbury, Otago and Southland in 2019. You can register your interest for our full-scale national launch in term 2 of 2019. I’m not a teacher; can I still participate? If you work with groups of primary school students in years 5 - 8 at least once a week, we want to hear from you – please register! With the Electric Garden we provide 6 hours of professional development for teachers, delivered in one day 9am – 4pm. The teacher training day covers an overview of the Digital Technologies curriculum, vege gardening, the Internet of Things (IoT), how to use the Electric Garden, the accompanying learning materials, and basic troubleshooting tips. Do teachers need to know how to code? The Electric Garden assumes no prior knowledge of coding for teachers and students, and provides all resources and full support for delivery of the digital technologies curriculum. If you managed to get yourself to this website, you meet the minimum requirements! Who created the Electric Garden? The Electric Garden is an initiative of Digital Future Aotearoa.